We do research on neural correlates of consciousness (NCC). 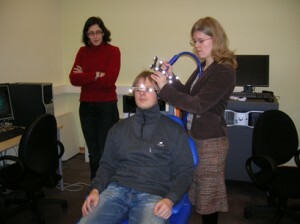 For this we use EEG and transcranial magnetic stimulation (TMS) equipment supported by MRI based neuronavigation. Primarily we stem from the methodological principles of contrastive analysis suggested and adopted by Francis Crick, Christof Koch, Bernard Baars, Nikos Logothetis et al. Thus we regard consciousness contents and states as experimental dependent variables. NCC can be meaningfully studied especially in the conditions where stimulation and task stay invariant, while consciousness varies. In order to do this, we typically use psychophysical experimental protocols and setups – masking, metacontrast, afterimages, stroboscopic displays, etc. in combination with EEG/ERP and/or TMS.